Fellow pet-lovers, I’m delighted to share Colleen Gordon and her healing work with you! Colleen is founder of Healing for Pets and a talented Pet Communicator, Licensed Massage Therapist and Usui trained Reiki master. Her mission is to be a bridge of communication, whether it be between people and their pets or people and their bodies. I can’t thank Colleen enough for saving my mother’s cat from being given away. My mom has had Miss Kitty for about 6 years. Not long after Miss Kitty came to live with my mom she had a UTI and had started to urinate around the perimeter of the rug near her box. Though Miss Kitty was no longer ill, she still used the rug to urinate, even having had the carpets thoroughly cleaned. But now my mother’s house had sold and mom was moving into a rental luxury condo and my fears of Kitty peeing on new carpets made for huge worries. 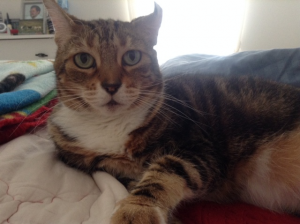 So I contacted Colleen whom had brought us comforting reassurance during my dog’s last days and told her of Miss Kitty’s issues. I sent Colleen photos of her and Colleen replied with great insight as to Miss Kitty’s difficult start in life, her discomfort in the feel of the litter on her paws along with some easy solutions. I am happy to report Miss Kitty has gone in her litter box now with newspaper added on top to soften her touch and has not misbehaved. Colleen! You are a genius! Thanks again! 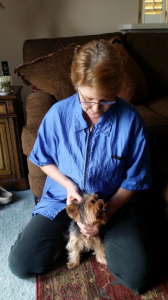 I just wanted to thank you for continuously helping ‘Annie.’ The massages you give her once a month really help her back legs, and get the circulation going, which helps her whole body. You’ve helped me with my furry babies for years and always done the best job, whether it be trying to understand what is going on with their health, or even what they are thinking … you really understand animals. The chair massage as well as full body massaging for me has really helped my 2 new hips. Coming into my home with the chair massage was totally relaxing! I was so worried about Starr, she appeared to have had a neurological problem where one of her front paws was paralyzed. Having taken her and her four siblings into my heart and my home 18 years ago, she was the last one still with me. She is everything to me. Although I know she is ill and going to leave me one day, I needed to know more about what was going on, and more importantly, I needed to find out what Starr herself wanted me to do. How far does she want me to go medically to save her life? I found Colleen by asking friends, and she was wonderful. She tapped into what Starr was feeling and found out Starr’s wishes. A few days later, Starr appeared to suffer what might have been another stroke and this time both her back legs were paralyzed. I called Colleen again and she was very comforting and reassuring. She confirmed that Starr was sending me very clear messages that she was ready to go. Even though I wasn’t ready for her to go! Colleen was with me through all of this, and never minded how many times I called her on the phone to walk me through this difficult decision. I am so blessed and grateful to have had Starr with me for all 18 years; some of her siblings only lived 6 to 9 years, but she was very special to me; I think we were both alike in so many ways and meant to be together. It was very hard letting her go since she was the last of the 5 kittens I brought home with me. Although I miss her physical presence, I know she is still with me. Colleen also confirmed this for me. Her water bowl ended up drained of water several days in a row, even after I filled it. There was no logical explanation for this. Colleen said Starr was showing me signs that she is definitely still with me in spirit. There is a huge void in my heart, but I want to honor Starr’s life by helping rescue groups. Maybe I can be a “kitty cuddler” to give them the love and affection they need. That would help me to fill that hole in my heart. Many thanks to Colleen for everything! 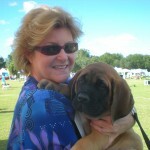 Colleen Gordon has been helping people and pets bridge the gap of communication and provide healing in the Orlando area for over a decade. She can understand your pet’s needs simply by asking him or her. There is help available to heal without chemicals or drugs. If you are worried about your dog’s health or your cat’s behavior, or have an animal that is sick, injured, stressed or depressed, there are alternative healing therapies available to you. Visit HealingForPets.com to learn more.